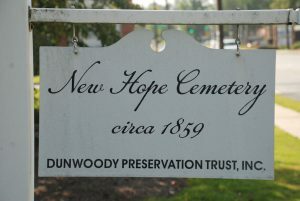 Nestled in the heart of Dunwoody is a hidden gem that most residents have never seen nor heard, New Hope Cemetery. 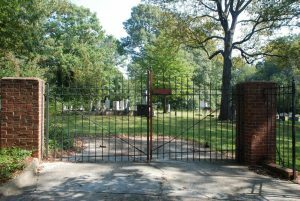 Located about ½ mile north from the intersection of Mount Vernon and Chamblee-Dunwoody Road, the cemetery is now found behind the KinderCare Learning Center. Within its fenced borders is the resting place for more than 350 individuals representing the founding families of Dunwoody. A few of these family names include: Spruill, Manning, Warnock, Cheek, and Martin. New Hope Presbyterian Church was the third church established within the Dunwoody area. Established in 1885, New Hope served the local community until it disbanded in 1917. All that remains of this church is this private cemetery. DeKalb County Land Lot records show that Dr. Warren M. Duke donated one acre of land for the church and cemetery in the mid-1880s. Dr. Duke, a prominent physician in this area, is also buried at New Hope. The first known burial was May 1887, with the most recent one in 2014. All individuals who were entombed here represent either members of New Hope Church or their direct descendants. William G. Akins, Private, Co. F, 36th Regiment, GA Volunteer Infantry, Army of Tennessee C.S.A. 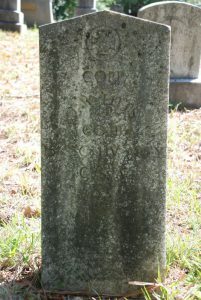 Thomas J. Conway, Private, Co. I., 81st Alabama Infantry, C.S.A. W. Fitts (Jesse W. Fitts), Corporal, Co. B, South Carolina 15th Heavy Artillery Battalion, C.S.A. Aside from Akins and Warnock, little else is known about Conway or Fitts. Did they stop here on the way home? No one knows for sure.